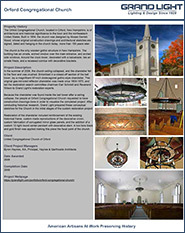 The Orford Congregational Church, located in Orford, New Hampshire, is of architectural and historical significance to the town and the northeastern United States. 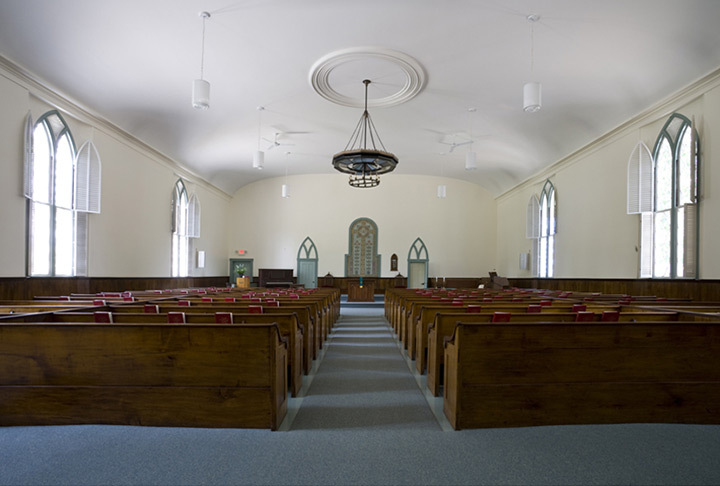 Built in 1854, the church was designed by Moses Gerrish Wood, whose original construction drawings and architectural sketches are signed, dated and hanging in the church today, more than 150 years later. 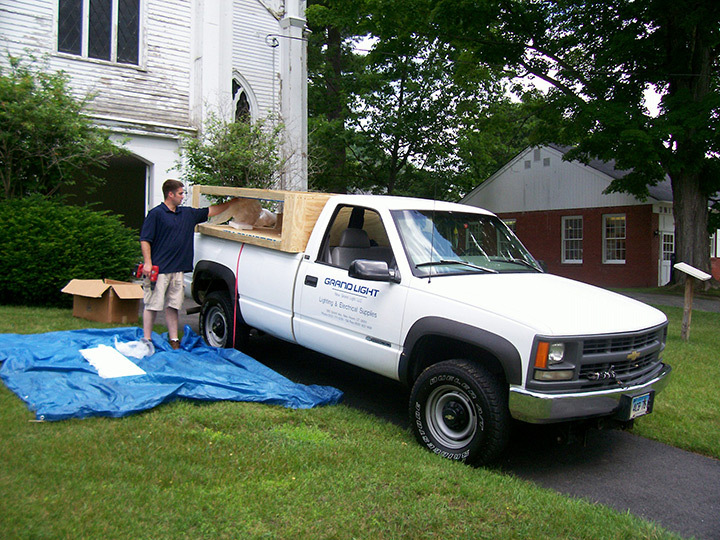 The church is the only wooden gothic structure in New Hampshire. 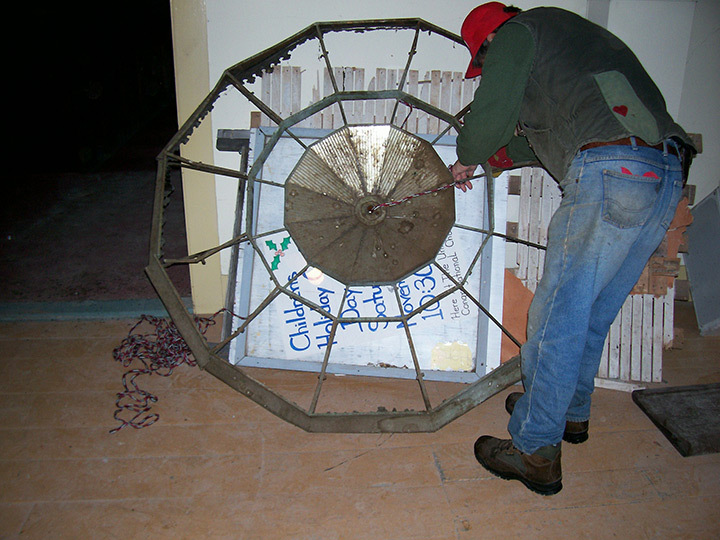 The building has an ornate, arched window over the main entrance, and arched side windows. 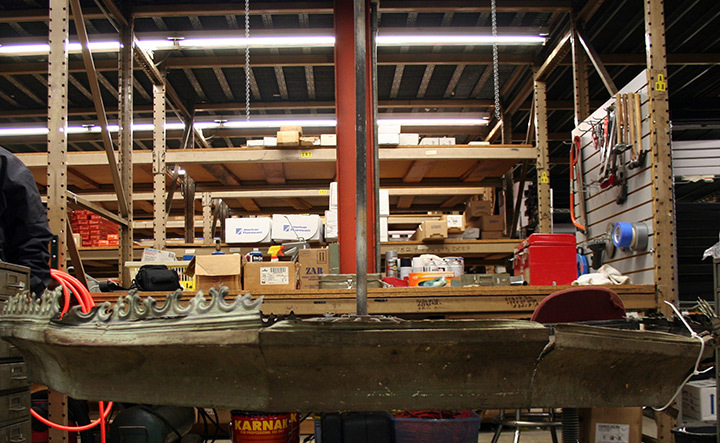 Around the clock tower, decorated with a balustrade, lies an ornate frieze, and a recessed cornice with decorative brackets. 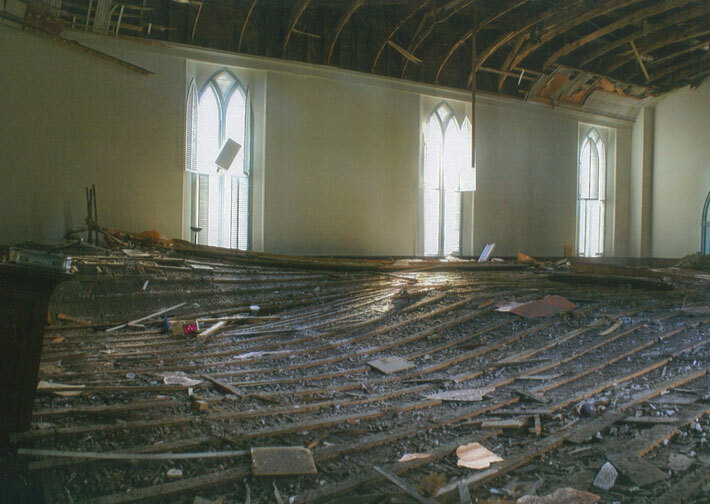 In the summer of 2006, the church ceiling collapsed, and the chandelier fell to the floor and was crushed. 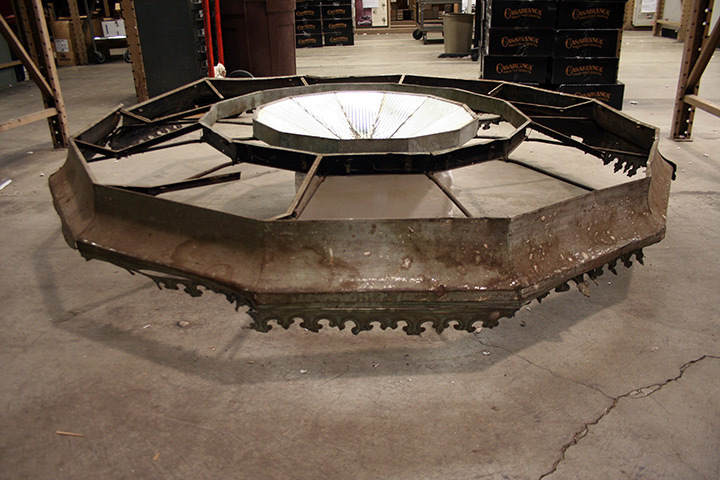 Entombed in a closed-off section of the bell tower, lay a magnificent 67-inch dodecagonal gothic-style chandelier. 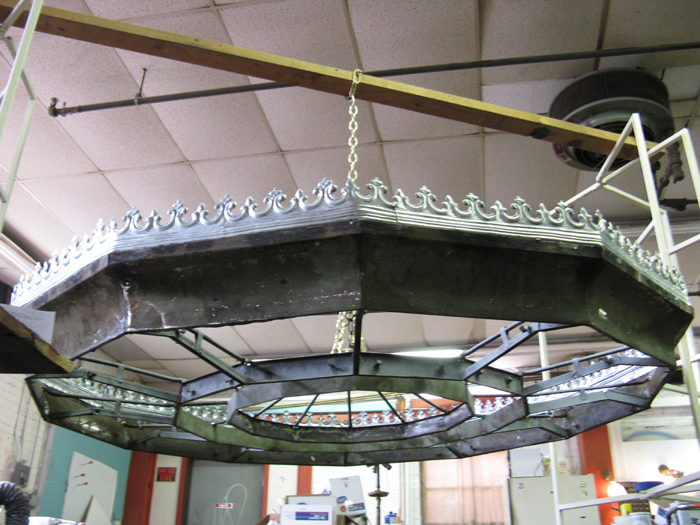 This original gas-mirrored reflector chandelier was made circa 1854-1870, and led the restoration search committee chairman Carl Schmidt and Reverend Wilson to Grand Light’s restoration experts. 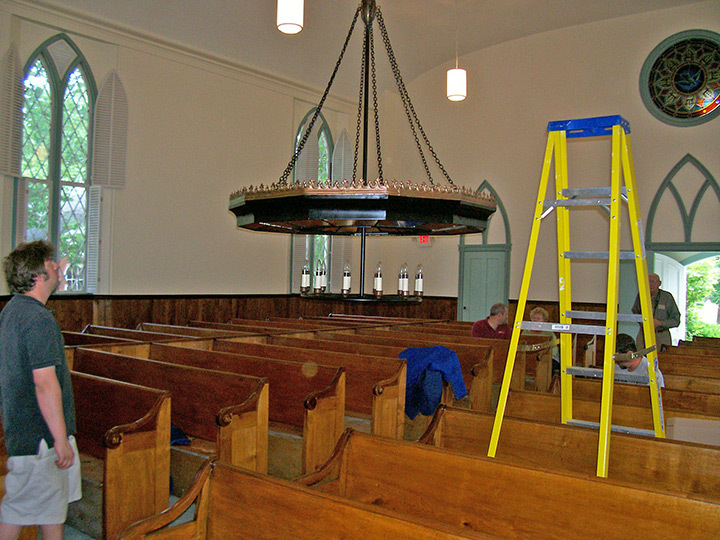 Because the chandelier was found inside the bell tower after a ceiling collapse, the people at Orford Congregational Church requested to have construction drawings done in order to visualize the completed project. 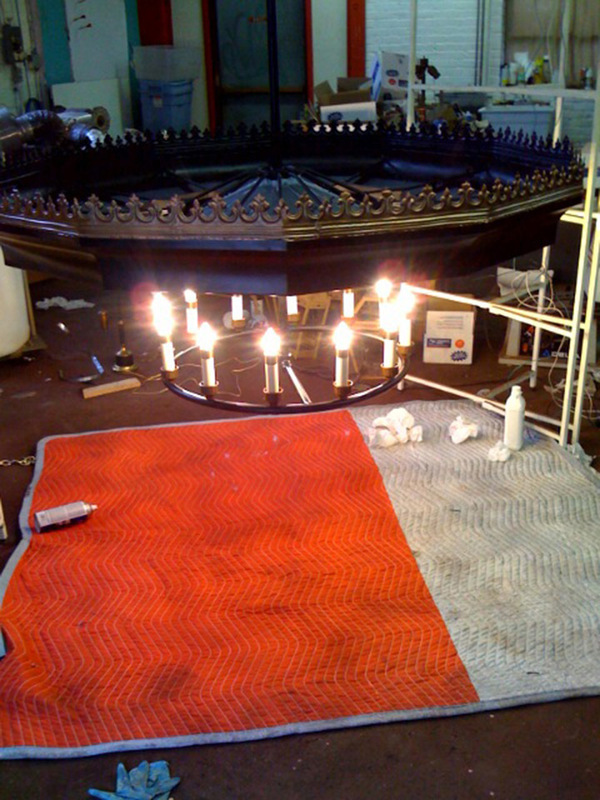 After conducting historical research, Grand Light prepared these conceptual sketches for the Church in the initial stages of the custom restoration project. 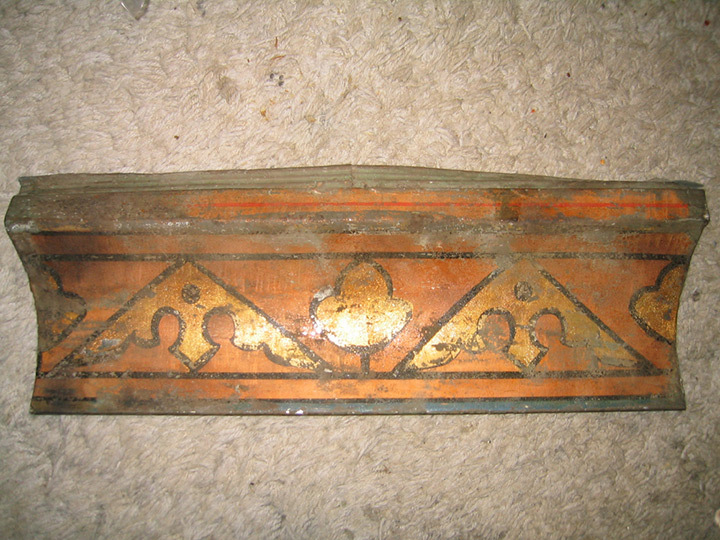 Painted finish to be determined by the church. 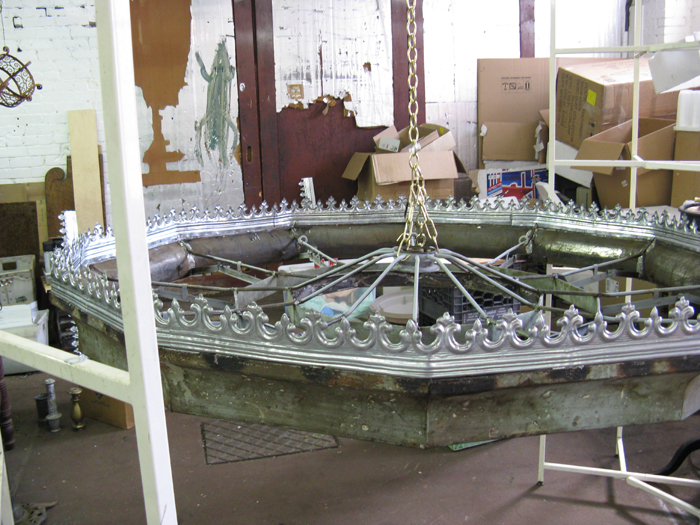 As Grand Light’s restoration specialists were working on the chandelier, they made an interesting discovery. 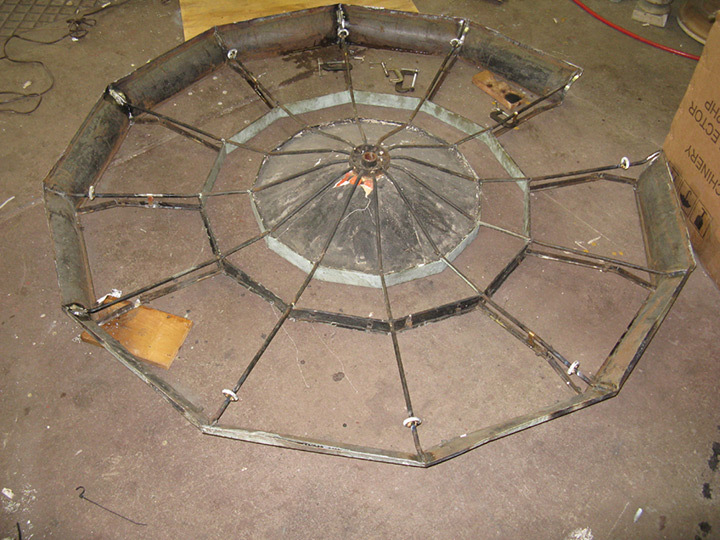 While cleaning the oxidation off of the frame, the team found a striking poly-chrome stencil beneath the verdi-green overcoat. 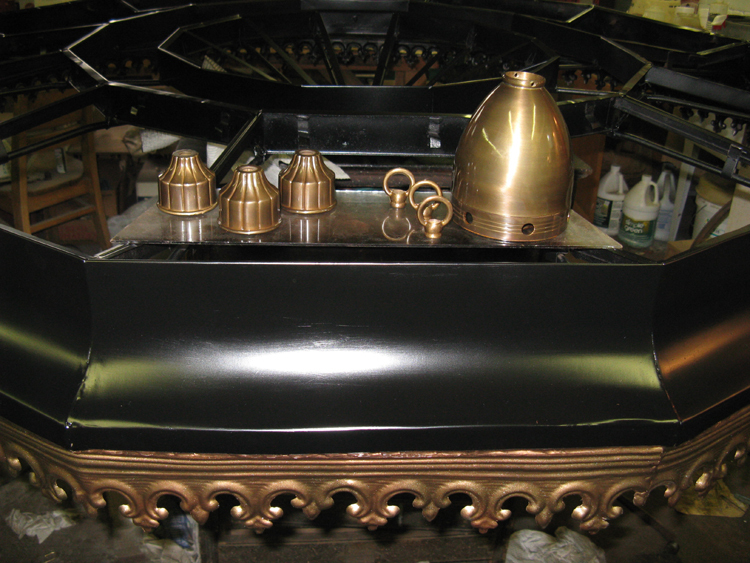 After conferring with the church restoration committee, it was decided that the stenciling would be refinished as originally intended. 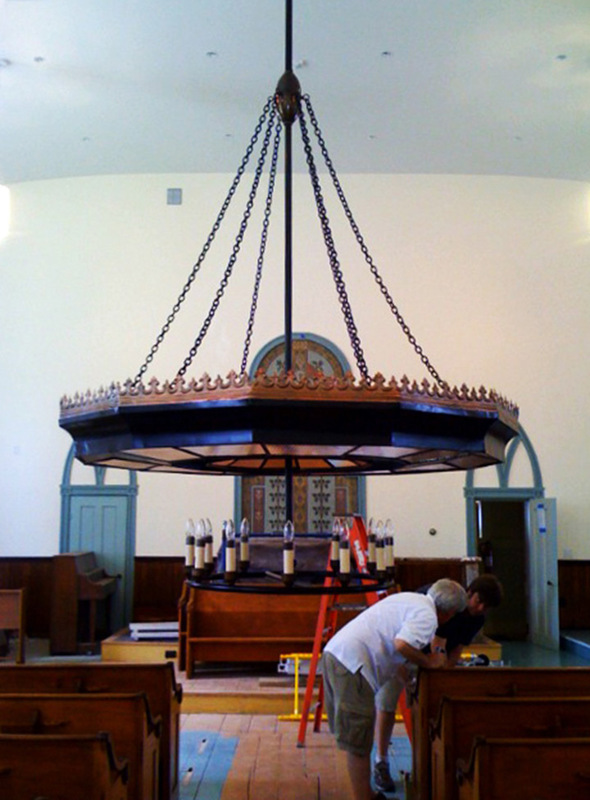 At 6:30 a.m. on the scheduled day of delivery, members of Grand Light’s restoration team made their way up to Orford, New Hampshire with the completed chandelier in tow. 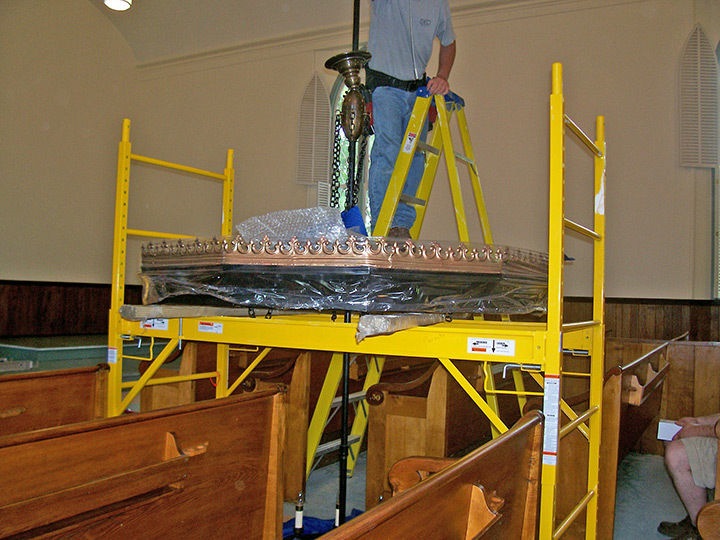 Carefully crated and packed, the fixture arrived at the church at 11:00 a.m. and the installation process began. 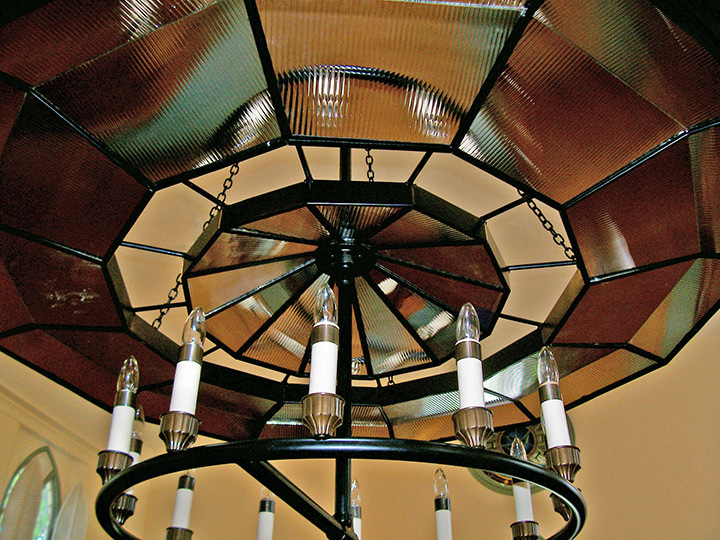 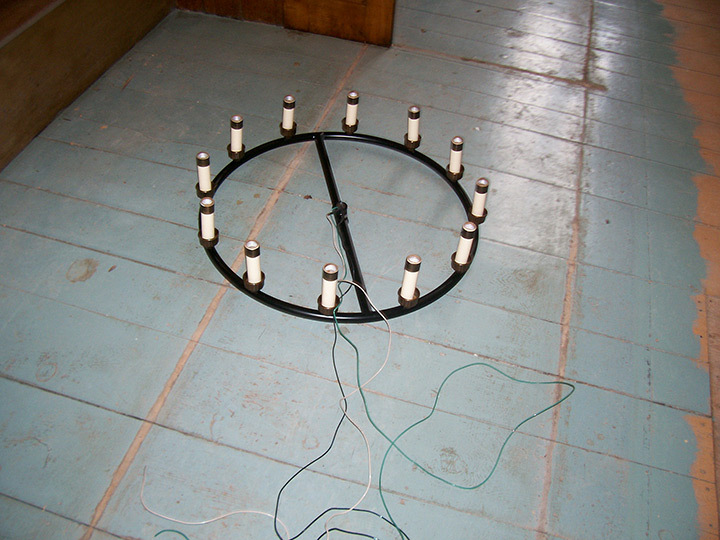 Once assembled at ground level, the electrician connected the chandelier to the light lift and finalized the installation by attaching the completed piece to the ceiling. 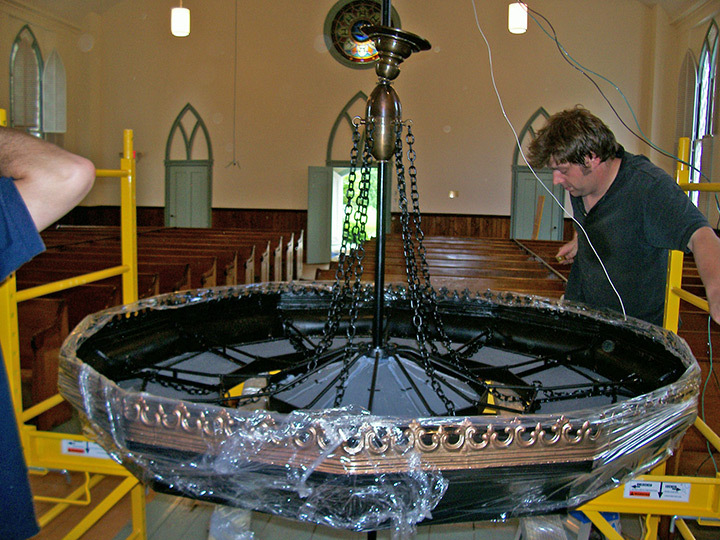 With the antique carefully installed, a small crowd of spectators gathered for the first lighting of the newly-restored piece. 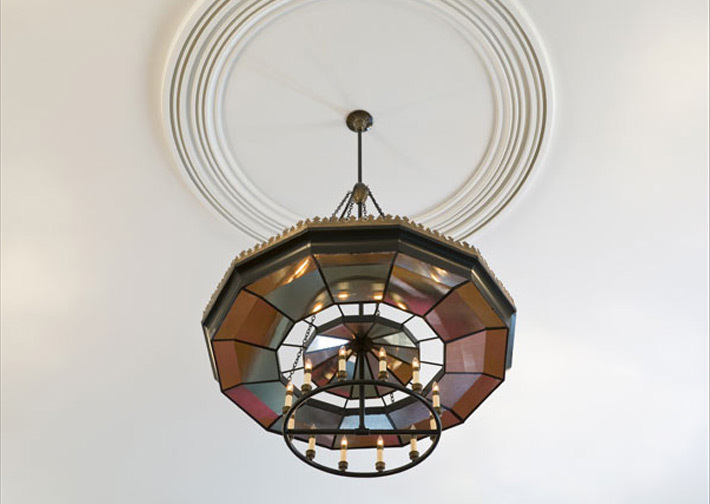 With the flip of a switch, the illuminated chandelier drew gasps of wonderment from Reverend Wilson, and the manager of the church restoration, Carl Schmidt, both of whom were impressed by the impeccable craftsmanship of Grand Light’s team. 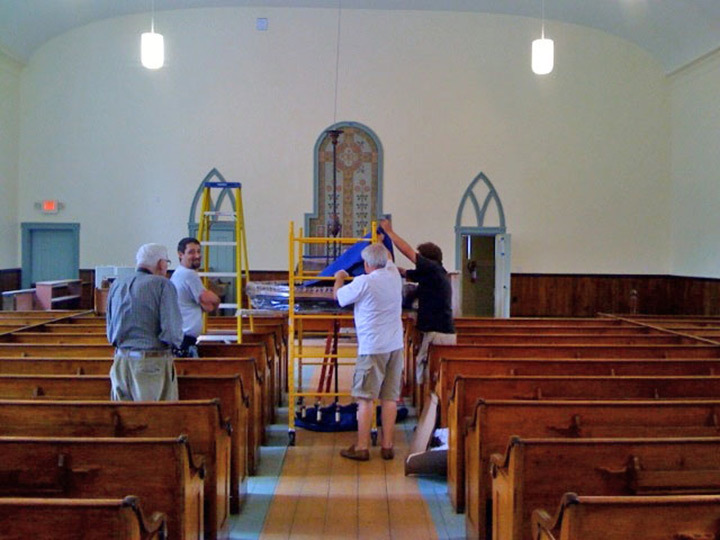 With a hearty round of applause from various congregation members, the restoration committee and other on-lookers, Grand Light’s work for the church was complete.